How often do you reach for a snack or two? When we combine foods, it makes our choices taste better. Did you know, though, that combining the right snack flavors could help you lose excess weight? That’s because when we combine certain foods, they give us a much-needed energy boost, enhance digestions and boost your metabolism so that fat keeps burning even when you’re not moving. Research shows us that around 50% of our eating is snacks, which is about a third of your calorie consumption. That’s a lot, isn’t it? So, what makes a “good” snack combo? Which tasty morsels, when combined, can help give you the metabolism boost you’ve been looking for? Berries contain quercetin while apples contain both quercetin and catechins. These ingredients work together to improve platelet clotting, known to boost energy and help possibly prevent cardiac events, such as heart attacks. How often does yogurt feature as your go-to snack? For me, it’s almost daily. It’s delicious, we know it’s good for us and, when we’re struggling to lose that belly fat, yogurt is packed with vitamin-D to give us a boost. Studies show that diets rich in vitamin C and calcium (both of which you’ll find in yogurt) can significantly decrease unwanted fat that your body absorbs and stores. But, if you’re looking for a mega metabolism boost, add cinnamon. 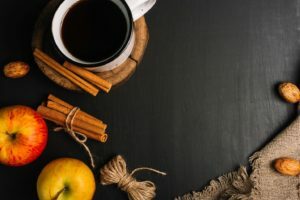 Cinnamon is a potent antioxidant that helps improve the body’s composition as well as insulin sensitivity to ward off a build-up of belly fat. Skim milk is a great way to reduce your saturated fat intake, however, you still need some fat for vitamin absorption. By adding a serving of flaxseeds or walnuts to your daily skim milk smoothie, you can boost your metabolism and a enjoy a more satisfying snack. Do you ever grab a hard-boiled egg on the go? It’s one of my go-to protein snacks, and eggs are highly efficient fat burners to boot! They help with carotenoids absorption – those pigments that give vegetables their vibrant colors. Eggs also help fight off weight gain and protect vision loss while aiding in muscle recovery and improving skin and nails. That’s a lot of benefits! So, the next time you make a plain, green salad, add a hard-boiled egg or two for added fat-fighting benefits. Avocado toast isn’t just all the Instagram rage, it’s a serious metabolism-boosting snack. Provided you pair it with the right things. Avo is packed full of healthy fats and oleic acid that help you feel fuller quicker and for longer. Squash it on sprouted grain bread that’s packed with fiber and you’re in for an extra-filling taste sensation. Add a dash of cayenne pepper, too. Studies show that people who eat capsaicin eat at least 200 fewer calories at their next meal and it helps to burn belly fat. These are two delicious fruits that contain a powerful punch of antioxidants to reduce the build-up of fat. It’s the perfect combo for midday or afternoon, but always remember to enjoy your snacks in moderation. While fruits are healthy, their sugar content can add up if you go mad on portions. Coffee is one of my favorite snacks in a mug. I find it fills me up and when I add it with anti-oxidant rich cinnamon, it gives me an energy boost and helps reduce belly fat. I’m always going on about mindfulness, and it’s just as appropriate to mention it in terms of snacking. Before you grab a snack, think about why you’re reaching for it. Are you really hungry? Tired? Bored? Craving something? I used to snack when I was just looking for an excuse to break concentration. So, when I realized my snacking was an excuse, I started getting up and taking a walk, doing some stretches and grabbing a cup of cinnamon coffee. Now that I understand the power of metabolism boosting snack combos, though, I find that I make better snack choices so that I have more energy, concentration, and drive. Do you have a favorite combo that keeps you going? Check out my nutritious tips at marksalinas.com. 3 users commented in " These Snack Combos Will Boost Your Metabolism "
Yumm…love these foods and tips !! Great topic.